I just got this great salt and pepper grinder from Elacra. I love this grinder because it is super stylish. It’s a combo grinder so one end is for salt and the other is for pepper. Just open up the ends and add salt to one and pepper to the other. Pop off the top and grind out your fresh salt or pepper. I love to have fresh ground salt and pepper on my food so I love having it all in one container. It’s super stylish too. I leave mine out on the table and it looks so nice and stylish. It’s plastic and stainless steel but it has a very sleek look. It’s really a nice piece. *IMPRESSIVE DESIGN* Salt and Pepper Shaker with stainless steel accents and see through panel is aesthetically pleasing and gives a modern, sleek designer look without any risk of rust. *EXCELLENT PERFORMANCE* Pepper Grinder and Salt Shaker is easy to fill or twist to adjust coarseness, providing speed & convenience in the kitchen. Releases aroma & flavors immediately prior to use. *SUPERIOR VALUE* Salt and Pepper Shakers provide great savings as a freshly ground pepper will need lesser amount of spices and give protection from stale spices. *TOUCH OF CLASS FOR FOOD PREPARATION* Salt Grinder and Pepper Mill creates a fresher and fuller flavor, making an average cooking into a world of gourmet-tasting meals. Keeps freshly ground salt n pepper. 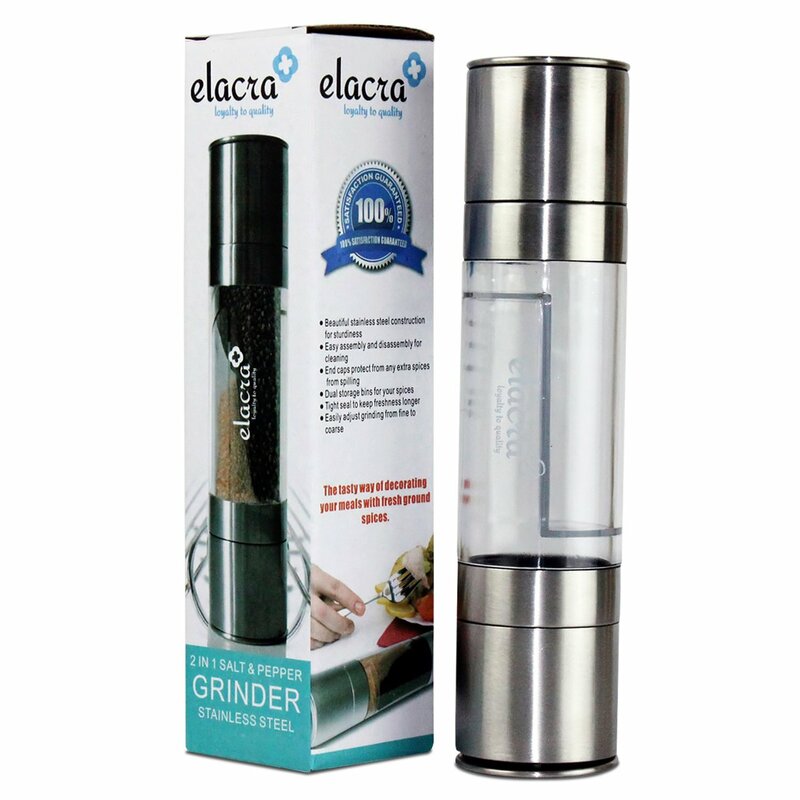 *HIGH QUALITY & DURABLE* Elacra Pepper Mill Set is equipped with ceramic grinding mechanism to ensure consistent grind for many years. Larger capacity keeps from refilling so often.